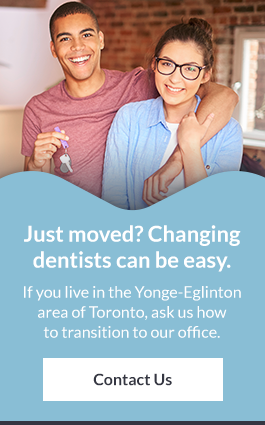 Are you thinking about braces and live in the Yonge and Eglinton area? Capitol Dentistry in Toronto offers Invisalign® as an alternative to traditional braces. If you are considering the Invisalign solution and live in the Yonge-Eglinton area of Toronto, you should visit Capitol Dentistry - we are proud to offer the Invisalign solution to our Toronto patients. Some dental plans may cover orthodontic treatment. To find out if you are a candidate for Invisalign®, we will take impressions of your smile and use 3D imaging software to create a series of clear aligners. Then, you'll wear each Invisalign® aligner in the series for approximately two weeks before moving on to the next. How often do I visit the dentist during my Invisalign treatment? Patients opting for Invisalign® orthodontic treatment will need to attend appointments at our office every 4-6 weeks. This will allow the Capitol Dentistry team to monitor their progress. How much does Invisalign cost in Toronto? Your treatment cost will depend on a number of factors including: the length of your treatment and your desired results.